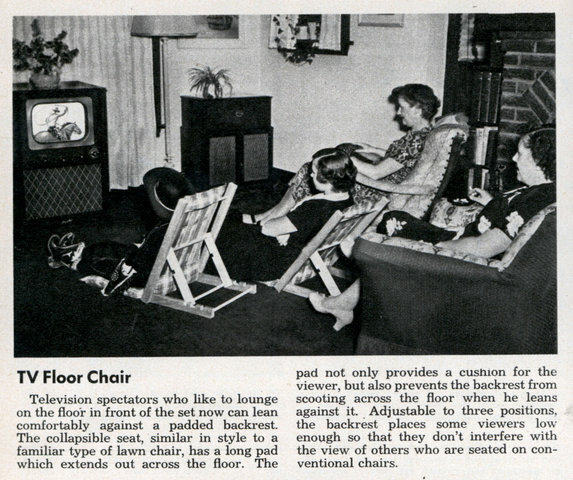 Television spectators who like to lounge on the floor in front of the set now can lean comfortably against a padded backrest. The collapsible seat, similar in style to a familiar type of lawn chair, has a long pad which extends out across the floor. The pad not only provides a cushion for the viewer, but also prevents the backrest from scooting across the floor when he leans against it. Adjustable to three positions, the backrest places some viewers low enough so that they don’t interfere with the view of others who are seated on conventional chairs.